Our brand new web catalog is now available. 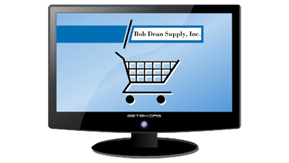 Bob Dean Supply, Inc. is a distributor of Industrial Power Transmission, Industrial Supply, and Pump Products. We offer a complete range of Machine & Fabrication Shop services and have a Pump Repair & Electric Motor Rewind Shop. Products in stock include mounted bearings, roller bearings, sprockets, chain, sheaves, V-belts, conveyor components, electric motors, pumps, power tools, fasteners, bolts, industrial Rust-Oleum paint, hand tools, hose & hose fittings, pipe fittings, weld fittings, valves, and steel of all types including angle, square tubing, pipe, tubing, channel, flat bar, round bar, square bar, keystock, plate, sheet, aluminum, and stainless steel. Our main office is located in Fort Myers, FL and our branch location is in Clewiston, FL. Our fleet of delivery trucks and our team of Outside Salesmen service a wide territory in Southwest and Central Florida from as far North as Haines City, eastwards to Fort Pierce, and as far South as Everglades City.